Dr. Padolsky can create your custom restoration in just one visit. Here he works with the patient to select the proper shade for her restoration. The CEREC system allows us to create beautiful porcelain restorations for you in just one visit. CEREC (CEramic REConstruction) is a state-of-the-art 3D imaging and milling technology Dr. Padolsky uses to design and create perfectly-fitted, high-quality porcelain crowns in just one visit! There is no need for a temporary crown. Dr. Padolsky is very well-trained and experienced in all areas of restorative dentistry and continues to take advanced courses, staying up-to-date with the latest dental technologies. He uses the CEREC 3D imaging system to make precision crowns, onlays and inlays, using high-grade porcelain for a durable, natural-looking result. He has many years of extensive experience placing crowns on patients. CEREC crowns can be completed in just one-visit. No temporaries or second appointments are needed. Your durable, natural-looking crown is precision-designed and placed that same day. Natural-looking. The porcelain used for CEREC restorations has the same kind of translucency as natural teeth. Ceramic blocks come in 17 shades for precise color matching. Strong and durable. CEREC porcelain is strong and lasting, even for back teeth. Studies show they last at least as long as metal-filled crowns. Accurate matching. Being able to digitally scan, design, mill and modify the CEREC restoration chairside allows Dr. Padolsky to create accurately matching and properly positioned crowns. Natural-acting. Because CEREC restorations are milled out from a single block of porcelain, they are less prone to cracks and flaws. The porcelain also expands in the same way that teeth do. Biocompatible, all-porcelain. CEREC crowns are milled out of a single block of body-friendly porcelain and don’t require any core material, including metal. The CEREC system allows Dr. Padolsky to custom-design a crown and mill it while you wait. 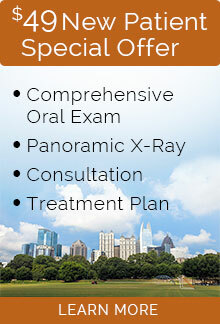 You and Dr. Padolsky choose the shade and shape tooth and Dr. Padolsky makes any adjustments needed right on the spot. 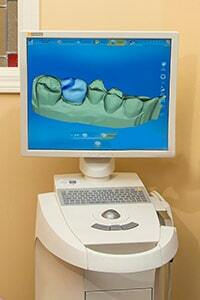 CEREC utilizes CAD/CAM technology to give Dr. Padolsky a 3D view of your tooth and surrounding structures. 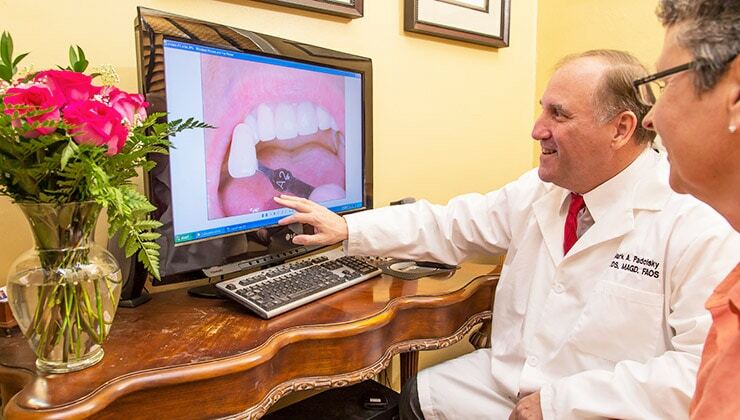 Dr. Padolsky scans your teeth with CEREC’s 3D camera, making digital virtual impressions. The images are fed into CEREC’s imaging software. Dr. Padolsky will design your crown virtually. He will choose the shade, shape and position that will match your other natural teeth so that your new crown will look great and align properly for a comfortable bite. Your crown is milled from a single block of quality porcelain. Dr. Padolsky will use CEREC’s milling machine to custom-craft your crown, cutting it from a block of high-quality porcelain that closely resembles the properties of your natural teeth. Dr. Padolsky can make immediate comparisons and modifications to the crown. There is no need to send the crown to a lab for adjustment. Dr. Padolsky makes any needed adjustments to the color, shape and size right in the office. Onlays and inlays are used in place of fillings to repair a damaged tooth. They are far less invasive than crowns which require that the tooth be shaved or ground down so that the crown will fit correctly. Dr. Padolsky uses onlays or inlays whenever possible because he believes that preserving tooth structure is extremely important. With advanced CEREC® technology, we can place onlays and inlays during one visit. After digital impressions have been made, we design your restoration and it is milled out of a single piece of durable, tooth-colored porcelain. The CEREC system allows Dr. Padolsky to design beautiful tooth-colored onlays and inlays for any of your teeth, even your back molars. The high-grade porcelain they are made from creates a beautiful translucent appearance that matches your original teeth. No need for multiple office visits or temporaries. Your CEREC onlays and inlays are done in just one office visit.